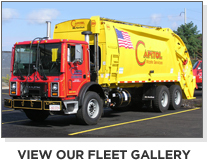 Capitol Waste Services, Inc. (Capitol) was incorporated in July 2002 and is a fully insured and bonded company. The company relies on its proven skills of its founders, Joseph Ricupero and Michael Merullo who bring over three (3) decades of business experience and will lead the company as it continues to establishes itself as a safe, dependable, responsive and cost efficient waste collection and disposal service provider. Learn more about the annual National Garbage Man Day Truck Show and see who else will be attending!